All About the Outfit: I am slightly coat obsessed ...! Jackets, blazers, cardigans (not technically a coat, I know) are so practical for layering here in Colorado with our bizarre weather and seasons 10 months of the year. I'm also obsessed with matching everything to an outfit, so having an option of coats to match everything in my closet makes life more fun and less stressful for me! When I saw this ModCloth, Delightful Direction Coat, I knew I had to have it. I had made some Black Friday returns and had store credit, so voila! This coat became mine! I really love it! It's a very sturdy canvas fabric and is thicker and therefore warmer than I was expecting (I really thought it would be a more "decorative" than "practical" coat in all honesty). My only (half) complaints are that because I'm medium-tall and have long limbs, the movement in my arms are (almost) restricted. The jacket arms do cover my wrists and I can stretch out in them, but too much movement makes me feel a pinch on my shoulder blades. Not a big deal though, as I would have returned it if it were worse. I'm wearing an XS for measure, and I feel that if I sized up to a small it would have been too baggy because otherwise this jacket fits like a dream!! 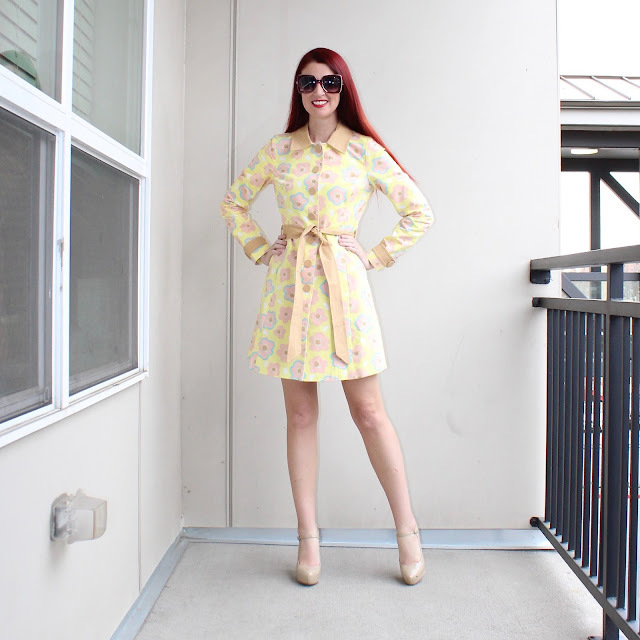 That said, if I had a gun pointed at my head I would say that my Jessica Simpson trench I reviewed a week or so ago fits a little bit better...though this jacket is more fun! Because it's a loud flower power 70s print with pastels mixed in with beiges, I found this harder to wear to match stuff than I was anticipating. This Delightful Direction Coat was delivered on Friday and I immediately wanted to wear it out an hour later when I attended a science lecture (cue the intervention for this party animal...I know!) and found myself stuck on what didn't immediately clash with it. Granted, it was an 80 degree day and the weather was going to dropping 20+ degrees at night, so that was real wrench in the works planning an outfit. (I wanted to wear a dress because it was warm and was ignoring all of my pants). But it did dawn on me that despite an affinity for mixing prints that this jacket won't match everything. Later in the week I paired it with this Express fit and flare dress and Nine West Mary Jane heels, and I'll probably stick with similar solid color dresses OR awesome 70s flared jeans in the future. Or I'll just be stubborn and wear it with clothes that REALLY don't match, ha. Happy Valentine's Day to all! As I mentioned yesterday I don't make a big to do of themed holiday posts and am private about my, well, private life on the Internet in general. But I do wish that everyone either has a blast with their sig/o or isn't feeling bad if they don't have one. I'm re sharing the Just Shair video below because it really does poke fun at both couples and singles on this day (in a fun way) and the video's shelf life expires TOMORROW ha. Check us out on social media as well, because we're having a ton of fun being festive using silly captions with both older photos and new ones specifically taking for VD that make us look romantical! (Facebook/Twitter/Instagram). Have a lovely day everyone! Emily and Fin Top with Hell Bunny's Paula Skirt-->The Oblong Box Shop MCM Fish Print in Satin-->Dog Days of...Winter-->"Sporting" with Tennis and Baseball-->Trench Coat Weather! I have watched the video and it's really funny - Valentine's Day has loads of posts about gift ideas, date ideas, what to wear on a date, what people wore on Valentine's Day, what this and that, oh-my-word - and such a video is refreshing. I loooved the coat, restricted arms movements may be bad, of course, but the coat is so beautiful that I would close my eyes for that :) Good that it not only beautiful, but a good coat as well! Loved the color, print and I love coats that can be worn as dresses! You look amazing, as usual! Hope you have a lovely day!